Today, third parties provide and enable more and more critical services to firms within the financial services industry. The process of outsourcing technology and services has reached a point for many firms where they are completely reliant on third parties to provide mission critical services to their customers and counterparties. However, as stated in the October 30, 2013 release by the Office of the Comptroller of the Currency (OCC), “A bank’s use of third parties does not diminish the responsibility of its board of directors and senior management to ensure that the activity is performed in a safe and sound manner and in compliance with applicable laws.” In order to firms to maintain oversight and exercise their responsibility, it is critical firms have in place and maintain robust and mature third party risk management program that encompasses all aspects of risk, and the many stages of the lifecycle that a third party relationship will transition through, as stipulated in a recent release by the Federal Reserve Board. Develop a clear matrix of all global regulations that pertain to third party risk for firms to have a clear view of their regulatory obligations, and to map those to the OCC Risk Management Life Cycle for Third Party Risk. Assist firms in maturing their internal third party risk management programs by providing tools, templates and guidance from across the membership. 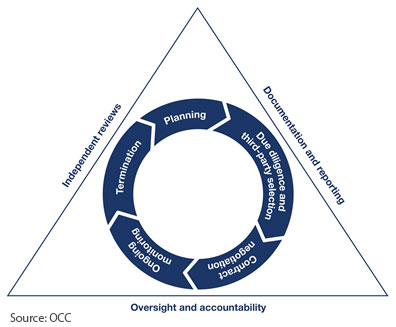 Align all work to the OCC Risk Management Life Cycle for Third Party Risk to provide a complete structure for how firms should be viewing the issue. The Task Force Working Group identified 17 different regulations globally that related to third party risk. The key criteria of those regulations have been captured in the two documents below and mapped to the OCC Risk Management Life Cycle for Third Party Risk. In addition, we have provided links to each of the identified rules. In order to improve the internal risk management program of the members, a program toolkit Working Group was formed to create and donate effective tools, templates and guidance that could be leveraged by all in the industry to address this risk and as much as possible, standardize the manner in which certain activities are conducted. The pieces of the toolkit are organized below to map to the OCC Risk Management Life Cycle for Third Party Risk. We expect this to be the phase 1 release of a multiple phase effort to create a comprehensive toolkit that covers all eight areas. SIFMA welcomes input on topics and areas for future development that will help improve the maturity of third party risk programs within the industry. Please submit requests to Thomas Wagner.